Language changes and evolves year after year and for the non-native speaker it can be hard to keep up with but there are some examples of natural, or idiomatic, English that have endured. 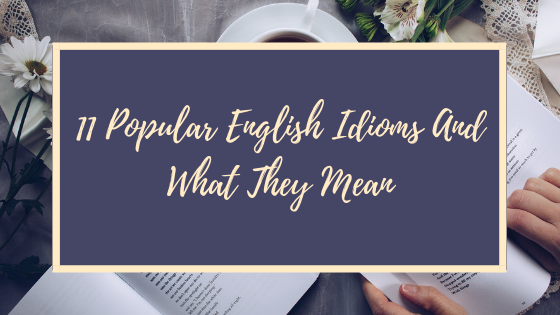 Here we take a look at some of the more popular idioms, what they mean and where they’re from. If there’s one thing the English like talking about, it’s the weather and this phrase simply means it’s raining hard. This expression can be traced back to the mid-17th century but probably stems from Norse mythology. This expression means something that doesn’t happen very often and probably refers to a full moon and the number of times it occurs during a calendar month. To see a full moon twice in a month is very rare indeed. Contrary to popular belief this expression doesn’t come from Alice In Wonderland but instead from France in the 17th century where hat makers were driven insane because of the mercury used in the hat making process. An expression that means to get something wrong. This probably refers to hunting dogs getting the wrong hiding place of their prey. Like the expression suggests it means a lull in hostilities. Dates back to the United States of America and the war between the Puritans and Native Americans. In the event of a treaty, the Native Americans would bury their weapons as a sign of peace. To be away with the fairies or distracted and not grounded in reality. It is unclear where this expression originates from but is probably self-explanatory. Simply means to understand how something works or to be experienced in something. Originating from the early 19th century where knowing the ropes of a sailboat was a useful and often necessary skill. To be found in the act of doing something wrong. This is an old English expression concerned with the killing of animals that didn’t belong to the slaughterer, who would still bear the animal’s blood. Something that is making you crazy! The timing of this expression is unknown but the meaning relates to climbing a wall in order to escape from something. Used to describe the character of a person who is outgoing and flamboyant. Originally used to describe British Prime Minister Winston Churchill. To make peace with an enemy. This expression stems from the Bible and relates to a dove bringing back an olive branch to Noah to show the flood waters were abating. Language students across the world ask the same question: why is English so hard to learn? 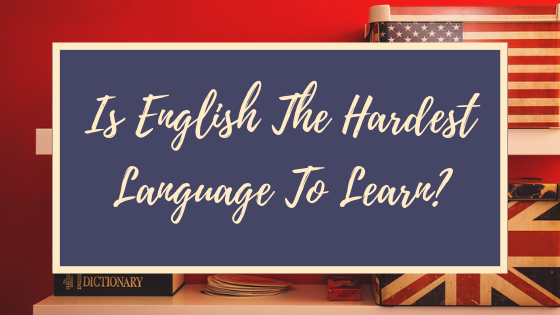 The answer is that, for many students, English is hard to learn because it involves memorizing a whole new alphabet, grammatical structure and set of rules. This alone can pose a number of issues with differences in pronunciation for seemingly random words, take ‘tough’ and ‘bough’ for example, same ending, completely different sound. No wonder language learners complain that English is hard. One of the areas in English that requires careful study. From present perfect continuous to dangling modifiers, grasping the subtleties of English grammar makes the difference between an English speaker and a proficient English speaker. In the English language there are many words that sound the same but have different meanings, for example ‘there’, ‘they’re’ and ‘their’ – three words that sound the same but have different meanings; there a number of these groups in English. In some cases, the words are spelt the same and pronounced differently, as in “he wound the watch up” and “he bandaged the wound”. Regional accents are another challenge and can make English hard to learn. Different accents change vowels and consonants, sometimes creating different sounding words entirely. For example in the north of England you’ll hear ‘bath’ to rhyme with the ‘a’ as in ‘cat’, however in the south, you’ll hear ‘bath’ with the ‘a’ as in ‘car’. Two completely different sounding words with the same meaning! The English language has grown with influences from other languages across the world and many of these words have become common parlance in the language today. For example, did you know Jodhpur and bungalow (a ranch house) are Indian words that have found themselves firmly placed in the heart of the English language? French too has given its influences with words such as depot, critique and so on. Finally, idioms: a set of English expressions that can be baffling to the learner but which are firmly rooted in English. An example of an idiom includes: once in a blue moon, an expression that means rarely or never. So how hard is English to learn? While it’s certainly not the hardest language, take Mandarin and how a simple change in tone can completely change meaning, it does have its sticking points. With scores of irregular verbs to learn and tricky pronunciation, it really does require some serious study to get just right. But, like in everything, practice is the key and practice really does make perfect. So many students nowadays are struggling with busy schedules and a ton of work. 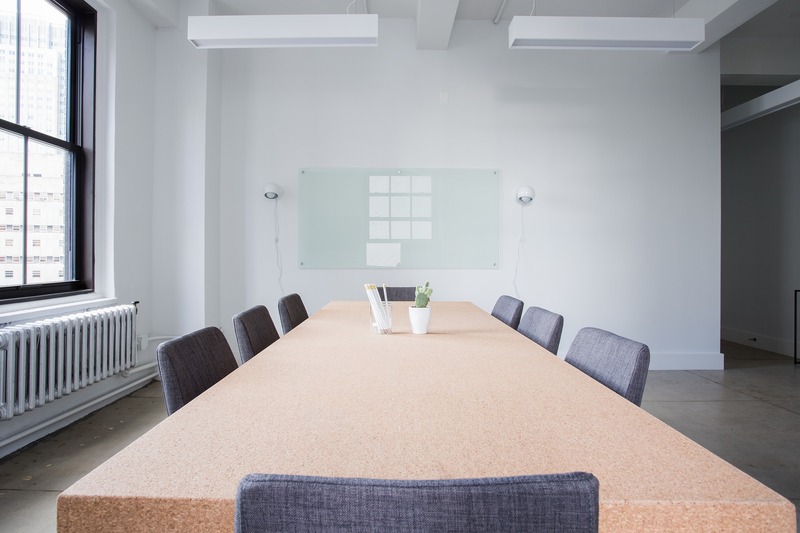 While this is good for building their responsibility and work habits, it can also be a bit overwhelming, especially if the student has a job. This means that there is no room for fun. What’s more, because of so many things on their to-do lists, students often forget certain tasks, essays especially. These can be tedious and boring to write but they also have a huge impact on the professors and the final grade. This is why essay writing g services exist – namely, Academized essay writing service. 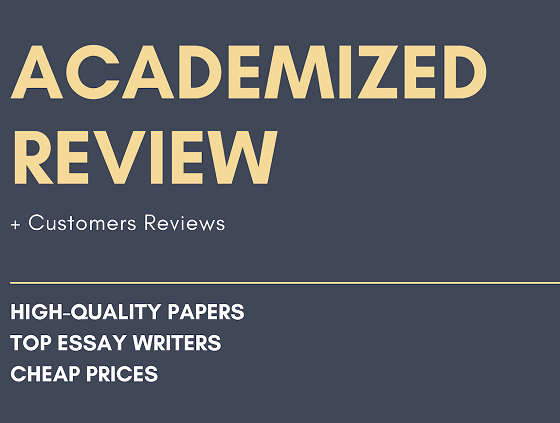 Academized is an essay writing service dedicated to helping students with their essays and various types of paper writing services. They strive to provide affordable quality and make sure that the students receive good grades. This essay writing service creates truly great papers. 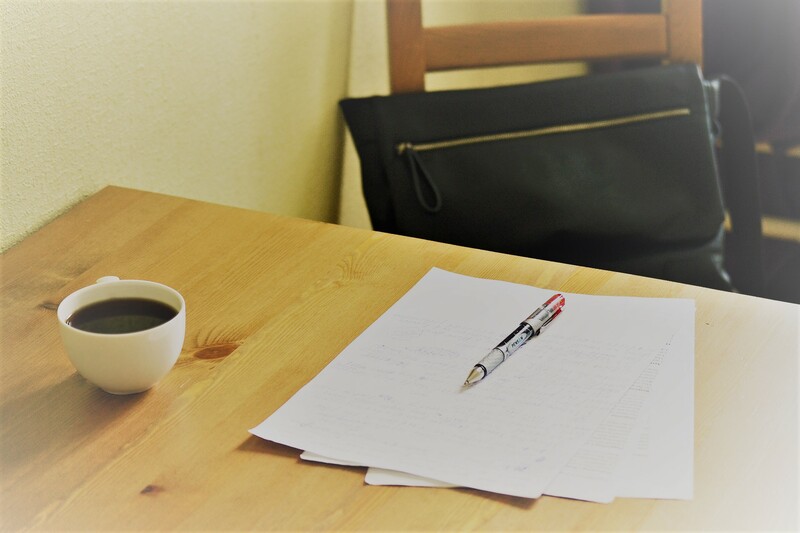 They make sure that the papers follow high standards by checking them thoroughly with a team of expert editors and proofreaders, checking for plagiarism and checking all of the sources in the essay. Their quality has been confirmed many times by loyal users. When on a tight deadline, it’s best to have a reliable partner like Academized.com. They value your time and they are always there to handle your papers. If you need a great essay but don’t have much time, this service will deliver on any reasonable deadline. Students have received their essay in eight or ten hours but you can expect the best value for money in 24 hours. Writers in this service are highly educated experts who love what they are doing. 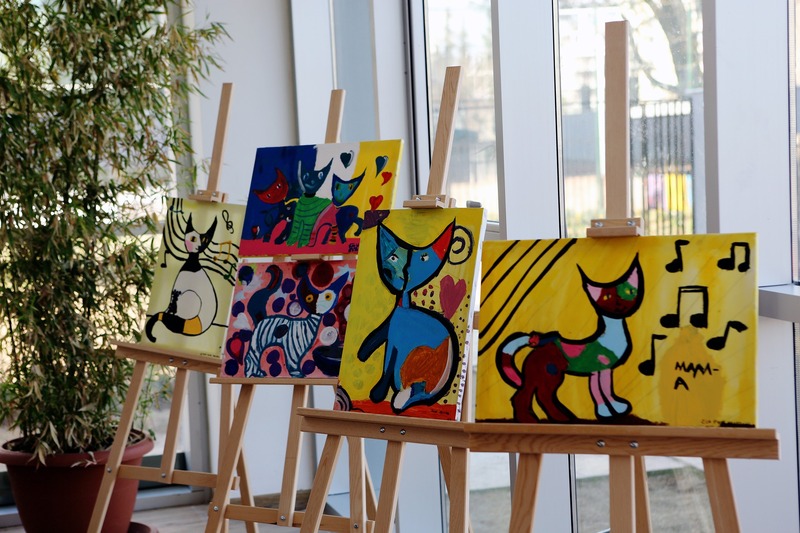 They are all native English speakers – as you will be able to see in their work – who take their work really seriously. Their writers are experts in various niches ranging from mathematics to languages and they can help you with any kind of essay. As a bonus, you can chat with them and check on their progress as they write your essay. 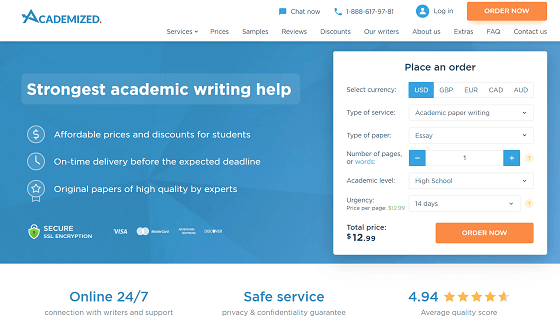 Out of all essay writing services out there, this one probably takes the award of being among the most affordable ones. The prices are very reasonable. Considering that their main customers are students, prices are extremely good, especially if you are on a tight budget or if you want to save some money but still get excellent service. One of the best things about Academized is that it has a consistent refund policy. This way, you can always be sure that you’ll get real quality. 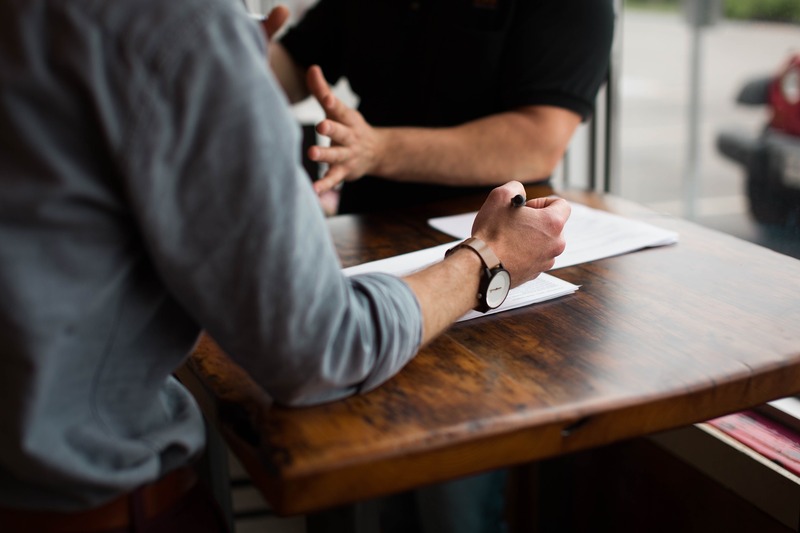 Even though the quality of the work they provide is high, they offer the refund if not satisfied because they know how important security and quality are to students, especially if they don’t have a lot of money to spend. One of the cons most people mention when it comes to Academized are extra fees but these only happen when you order extra services. Another commonly noticed con is that they can’t deliver a paper in less than 6 hours. But if you want quality, you shouldn’t expect them to. If a customer misuses the research material from these subjects, it can lead to them having a fake degree which is inherently wrong. Most of the online feedback from the website and the third party sites are positive. People often say that this essay writing service can write any kind of academic paper, even a resume or CV which is great. 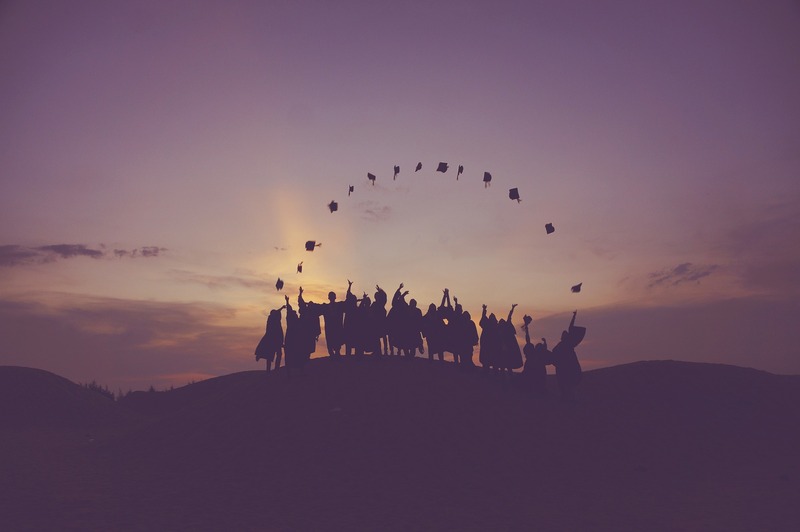 Students also often thank this service because they are finally able to relax a little bit, especially those who are writing a dissertation. People are also commonly mentioning how their professors are happy with their essays and how they got great grades. They also praise this essay writing service for helping them with hard subjects like statistics and math and writing essays on other difficult subjects. “Excellent work. Easy to use and had the best price. Was in hours before expected. Wonderful, Wonderful, Wonderful. “says Jackson, US, A Senior. “Our science teacher loves tests just as much as he fails at creating them. I feel like an underpaid detective when trying to unravel what exactly is being asked in a question. Now that I delegated this task to academized I feel much happier. Sometimes they don’t get it all right too, but generally, my grades are good. “ Yorda, Frystown, PA, US, High School. When you are in need of a reliable assistant in your essay writing, Academized is definitely the way to go. It is an excellent essay writing service which provides high-quality papers created by native English expert writers, edited and plagiarism checked. It’s also very affordable for students and it delivers right on time or sooner. Of course, if you are looking for a service that can give you an essay within less than 6 hours, it’s hardly possible but if you are looking for quality, you’ll find this service helpful. To truly get the message across to your reader – the professor – your essay has to have brilliant wording. You could make a great point but if you say it poorly, your grade won’t be as good as you hoped for. 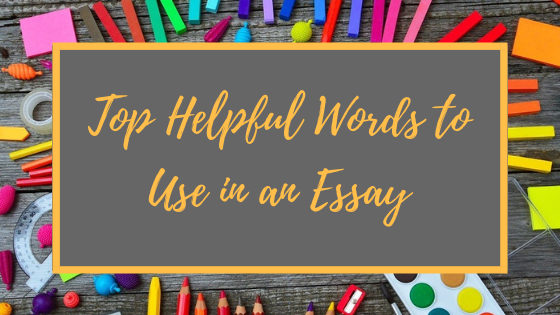 There are some good words to use in essays that could make all the difference. Here are some of those essay words. This phrase can be used to introduce an explanation for the purpose of an argument. You can use this phrase when you want to explain something but in different words to make it easier to understand. This phrase is another way of saying “in other words” and it’s used to simplify complex points. This is one of the best words to use in an essay – it’s used to add more information. This word is also used to add more information, but in this case that information is similar. This phrase can replace the words “also” and “and”. Use it the same way you would use “moreover” or “furthermore”. Use this when you want to add something that agrees with your previous point. Use this word in your essay when you want to introduce something that disagrees with something you just said. This phrase can be used similarly to “however”. Use this phrase to cast doubt on something. You can use this phrase in the same way you would use “on the other hand”. Use this to introduce a contrasting idea. Use this phrase to introduce a point that stands despite the lack of evidence. Use this word to introduce or highlight something important. You can use this word the same way as “significantly”. You can also use this word instead of “in particular”. This phrase is most commonly used to introduce an example of the previous statement. You can also use “for example” or “to illustrate the point”. You can use this phrase to introduce a closing paragraph or a sentence in an essay. It summarizes your main points. This phrase means “taking everything into account” and it introduces a conclusion based on all of the information you have provided. This phrase introduces your main point, the main conclusion and the main message of your essay. 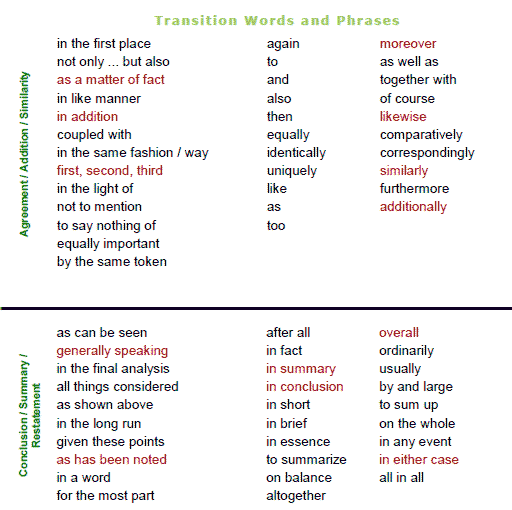 There you have it – some of the best phrases to include in your essays. They can replace mundane words and add more flair to your style of writing. There are many confusing things in English language but nothing is as confusing as homophones. Homophones are the words that sound the same but are spelled differently and have a different meaning. They are fairly common in the English language. Most adult people know the difference but it can be really confusing for a child just learning to read or people learning English. 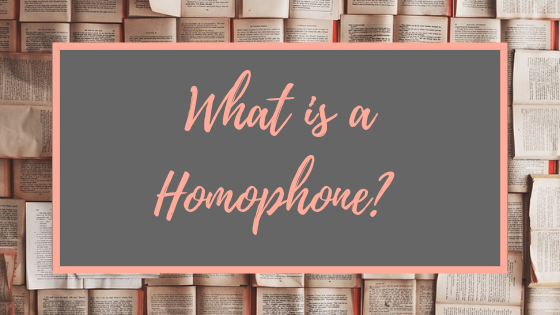 Homophone – all words that sound alike but have different meanings. 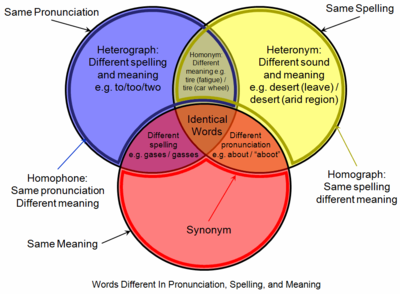 Homograph – all words that sound the same and are spelled the same but have different meanings. Affect indicates influence. Effect is a noun, meaning consequence. To is a preposition while too means excessive and two is a number. Buy means to purchase while by is a preposition used to show direction and bye means goodbye. Weather is a word used to describe the state of the atmosphere while whether is a conjunction which introduces choices. Stationary means that something is standing still while stationery means pens, pencils, paper, notebooks and so on. Compliment means to say something nice to another person while to complement means something that enhances or completes. Brake is a part or a motorized vehicle or a bicycle used to stop it while break means a pause. Aloud means to say something out loud and allowed means to give permission. To lie means to recline and lay means to place something somewhere. This is also often confused with to lie which means to not tell the truth and lye which is a strong alkaline solution. Bear is an animal but it could also mean supporting or holding. Bare means naked. This is one of the most common mistakes in spelling nowadays, especially on social media. Their means that something belongs to them, they’re is short for they are and there indicated the location. Accept means to receive something and except means to exclude. Know means to be aware of something while no is a word opposite to yes. Peace is a state of serenity and piece is a part, an element of something. Whole means complete or entire and hole means the lack of something or something missing. These have been some of the most commonly confused words in English language. Hopefully, this guide will help clear some of the confusion and assist you in using each word properly. Should Every Student Be Required To Take a Performing Arts Course? Editing and proofreading. It may seem like something journalists or teachers practice all day, every day, but the truth is, if you write, whether, on a computer or using a pen and paper, you must carry out these essential tasks. Michael Jordan doesn’t simply net basket after basket when he plays basketball; he must practice and refine his technique over and over again before it’s perfect. That’s exactly what you’ve got to do with your writing.